UK?s only superconducting anti-gravity project closes amid recriminations LONDON 04/04/04. The UK?s only Government sponsored research project on antigravity has closed for lack of funding. The IFFE (Invisible Force Field Experiment) project, headed by researchers Simon Hollington and Kypros Kyprianou, last year successfully created an impenetrable force field in The New Forest (Hampshire, England). Governmental scientific budget cuts have however blocked the half million pound investment that commercial development would have required. The British work is reportedly the first successful large-scale trial of the “Podkletnov” gravitational-shielding effect, discovered by Russian materials scientist Eugene Podkletnov at Tampere University (Finland) in 1992. 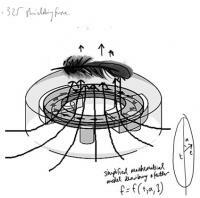 Podkletnov rotated a disc of superconducting material at several thousand rpm in a magnetic field, and found that objects above the rotating disk showed a measurable (2%) loss of weight. He believes the key element to be creation of a super high density of electrons or Cooper pairs (two electrons that pair up despite both having negative charge, and hence normally repelling each other) moving in a strong magnetic field. The story was broken in advance of Podkletnov?s technical paper by the London Times, and the resulting media sensationalism “considerably set back his research”. The story was followed up in Business Week (Feb 17th, 1997), Scientific American (June 2002) and others. I.F.F.E technician levitates magnet an early success at monopole stabilization Ultra-high-voltage static electricity modifies force field. must be switched off to allow access. Acceptance of Podkletnov?s work within the scientific community has itself been limited because of the difficulty in replicating the experiment. Hollington and Kyprianou have further alienated mainstream physicists by accusing them of making the quantum theory “overcomplicated”. Their simplified quantum modelling software predicted the new electrostatic correlations, and suggested that the resonance frequencies could be generated without the De Aquino configuration required by Podkletnov (“Podkletnov?s Complaint”). work. Hollington similarly claims that the relevant unit of the DTI has been closed down, and now denying ever having been involved. someone who told me that my name is ?on a list?” he said. Shielding properties of single-phase dense bulk superconducting ceramics of YBa2Cu3O7-x (original paper by E Podkletnov and R. Nieminen; Physica C 2O3 (1992) 441-444). YBa2Cu3O7-x against the gravitational force were studied at temperatures below 77 K. A small nonconducting and non-magnetic sample weighing 5.48 g was placed over a levitating superconducting disk and the loss of weight was measured with high precision using an electro-optical balance system. The sample was found to lose from 0.05 to 0.3% of its weight, depending on the rotation speed of the superconducting disk. Partial loss of weight might be the result of a certain state of energy which exists inside the crystal structure of the superconductor at low temperatures. The unusual state of energy might have changed a regular interaction between electromagnetic, nuclear and gravitational forces inside a solid body and is responsible for the gravity shielding effect. lattice with a defined order. lattice distances, optical reflection etc. show abnormal changes near the transition temperature. No overwhelming theory has yet been proposed to explain the mechanism of superconductivity and the abnormal behaviour of high-Tc oxide ceramic materials at low temperatures. The aim of this study was initially to investigate the shielding properties of dense y-based bulk superconductors against electromagnetic fields of various frequencies and intensities in a wide range of temperatures. But an unusual behaviour of the ceramic material observed during the first stage of this work initiated a separate set of experiments dealing with the shielding of the gravitational force. disk with a diameter of 145 mm and a thickness of 6 mm. The preparation procedure consisted of mixing the initial oxides followed by calcining the powder at 930 C in air, grinding, pressing the disk at 150 MPa and sintering it in oxygen at 930 C for 12 h with slow cooling down to room temperature. the disk raised over the surface of the helium. This massive disk maintained its temperature below 60 K for about 2.5 min. Two coils with rotating magnetic fields, similar to those used in regular electric motors, were placed on both sides of the disk, as shown in fig. 1. 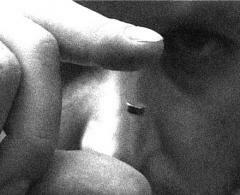 The disk levitated above the toroidal magnet and was able to rotate around its central axis at a variable speed. The frequency of the electromagnetic field in all three solenoids was varied from 50 to 10^6 Hz. A sample made of silicon dioxide hanging on a thread was placed over the disk at a distance of about 15 mm from it, and was separated from the He vapours by a thin transparent plastic foil. 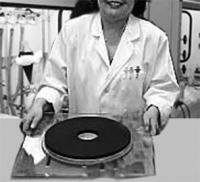 The weight of the sample was measured with high precision using an electro-optical comparing balance. to 7mm when its rotation moment increased. sample or the supporting thread. Also, the electrooptical balance was shielded from the possible influence of electromagnetic fields. explanation can be given for the case when the superconducting disk is rotated by the magnetic field. But it becomes rather difficult to explain the loss of weight when the field is switched off and the disk is still rotating, and the weight of the sample remains decreased till the rotation speed of the disk decreases. sample in the radio-frequency (RF) field generated by the solenoids on both sides of the superconducting disk. but these parameters depend on the temperature [3-5] and can change considerably under certain conditions. Intergrain boundaries were always regarded only as obstacles for the current, and it is known that the magnetic field penetrates inside asuperconductor mainly along the grain boundaries. According to our experience, this penetrating fieldinteracts with the superconducting grain boundaries in such a way that its further propagation inside the material is still possible along the grain boundaries but the intensity of the field is greatly reduced. momentum which yields a small gravitation shielding effect. It is well known that any physical body rotating around its vertical axis loses a part of its weight. Under certain conditions, the rotation of magnetic fields around the body might have a similar effect. In the present work the superconducting disk has its own rotation momentum and current carriers with the charge of minus two, and is moving in a highfrequency magnetic field. It might be possible that such a system modifies the magnetic field in such a way that it counteracts the gravitational force. rotational speed of the disk and has a tendency to increase with the speed of rotation. Fluctuations of the weight noticed in the experiment might be due to inhomogeneity and uneven density of the superconducting disk. E.H. Brandt, Science 243 (1989) 349. D.R. Harshman, L.F Schneemeyer, J.V. Waszczak, G. Aeppli, R.J. Cava, B. Batlogg, L.W. A.T. Fiory, A.F. Hebard, P.M. Mankiewich and RE. Howard, Phys. Rev. Lett. 61 (1988)1419. B.R. Weinberger, L. Lynds, J. van Valzah, H.
IEEE Trans. Magn. 27 (1991) 2415. A.B. Riise, T.H. Johansen, H. Bratsberg and Z.J. Yang, Appl. Phys. Lett. 60 (1992) 2294. E.H. Brandt, Am. J. Phys. 58 (1990)43.